Born and raised in Ketchum, Sloan Storey is using the Zions Bank Boulder Mountain Tour to help fight hunger in Blaine County. 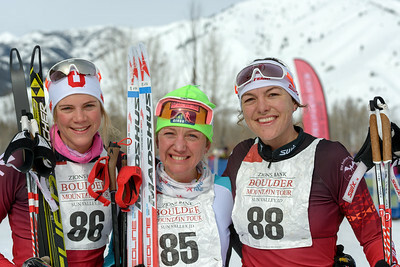 A graduate of University of Utah where she was captain of the cross country team, Sloan grew up skiing in the Sun Valley Ski Education Foundation’s cross country program and is now a coach with SVSEF. Marrying her passion for skiing and her role at The Hunger Coalition, Sloan is skiing in the BMT to raise money in the fight against hunger. Here is a letter she recently sent to friends and family. Sloan Storey (far right) in the 2016 Zions Bank Boulder Mountain Tour. For the last eight months I have been working for The Hunger Coalition, a nonprofit fighting food insecurity in my county. The role of the HC is to build a healthier, happier, more connected community through food. Whether that is providing good food to those that are food insecure (don’t have access to good food or can’t afford it), or providing a space for them to feel welcome, heard, and connected. We aim to address all root causes of food insecurity for all persons no matter their background or economic circumstances, because everyone deserves access to healthy food. One of the first questions I usually get asked is “How many people does the HC actually feed?” My response, usually a surprise to most, is that we fed approximately 4,000 individuals last year, half of whom are children. The need is here, and in today’s environment it doesn’t seem to be going anywhere. Most of our participants are employed and have a home, but are just one crisis away from not being able to afford basic household necessities. (The ALICE population — https://www.unitedwaytv.org/alice-report) A crisis similar to the current government shutdown. The Hunger Coalition is a progressive and effective solution to this life determining issue. The Hunger Coalition began as a basic food bank running off local donations. Today, the Hunger Coalition has grown to a choice food-bank (a food bank that acts as a small grocery store with nurturing and fresh foods the participants can choose from). As well as other community development programs. We have stepped away from the message of ‘Feeding the Hungry’ to ‘Building Community through Food.” With this new message we are encouraging our community to look at food justice as a whole, and engaging our participants in a new way to ensure we are fighting the stigma of being the ‘needy’ with self-empowerment. A couple examples of this in our community is the Hope Garden and Bloom Farm. At these locations participants can volunteer their time gardening and then walk away with their own handpicked produce. We also provide cooking classes, women’s gardening groups, teen internships, and food demos. All of which are organized by and for our participants to provide space for growth and pride. Sometimes its hard to put into words how much I think this organization is doing for our valley, but I have personally witnessed the growth and change it creates everyday.